Brothers Riker, Ross, Rocky, sister Rydel and their best friend Raitliff’s album ‘Louder’ are proving that their strong five person band are in fact getting Louder as the title suggests. R5 were signed to Hollywood records in 2012 and released their debut album on September 23rd with the album set to drop in the UK in early 2014. They are set to go on a hotly anticipated worldwide tour for their dedicated R5 Family fans in 2014 where they will be inviting their fans to vote which city they will play in via Facebook. The band are still debating the name of the tour, however both Riker and Rydel have hinted that it may in fact be called the ‘Dancing Out My Pants’ tour to the delight of the fans. Perhaps they haven’t taken into account that ‘dancing out my pants’ in America and ‘dancing out my pants’ in England are two very different things. The album starts with the infamous ‘Pass Me By’ that draws the listener in with intricate guitar strumming, perfect vocals, and a catchy tune you can’t help but dance along to. ‘Pass Me By’ also introduces the theme of love which is a prominent theme on Louder. The next track on the album is titled ‘Forget About You’ which is very much the track that you can sing along to in the car with the windows down. The fourth track on Louder is ‘I Want U Bad’ which is definitely a track that fans of Louder won’t hold back singing away at an R5 concert. Whilst the song explores the theme of lust and unrequited love it is a very lighthearted song with a catchy melody composed of a couple of piano chords, a steady drum beat and solid vocals from Ross. 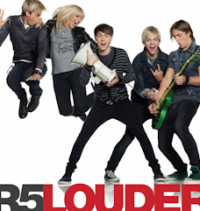 Another stand out track on Louder is ‘Love Me Like That’ where Rydel’s perfect vocals are given a chance to shine. Whilst she mainly provides strong harmonies for the band and plays keyboard, ‘Love Me Like That’ gives her the chance to take the lead and explore the theme of love from a girl’s point of view. ‘One Last Dance’ and ‘Loud’ are both slow numbers placed just before the final three upbeat tracks to form a natural progression on the album. ‘Cali Girls’ happens to be another of my favourite tracks on the album because of its quirky lyrics, its upbeat tempo and its subtly playful innuendos (because who doesn’t like those right?). It comes as no surprise that many of the R5 family fans are into this song, many of them probably wanting to be a Californian girl after hearing the track. Given the nature of the title this song could give the band the opportunity to change ‘Cali’ to wherever they are touring in order to draw their fans further into the performance. ‘Here Comes Forever’ is the final track on Louder alluding to the bands tour and future albums. This debut album definitely demonstrates why R5’s fanbase is growing on a daily basis. If you’re looking for a CD that you can mime along to with a hairbrush or dance along to with your friends then this is the album for you.